The International Space Science Institute-Beijing (ISSI-BJ) successfully held the XTP (X-ray Timing and Polarization)/GRAVITAS (General Relativistic Astrophysics Via Timing and Spectroscopy) Science Meeting at the National Space Science Center, Chinese Academy of Sciences (NSSC, CAS) in Beijing on June 26-27, 2013. 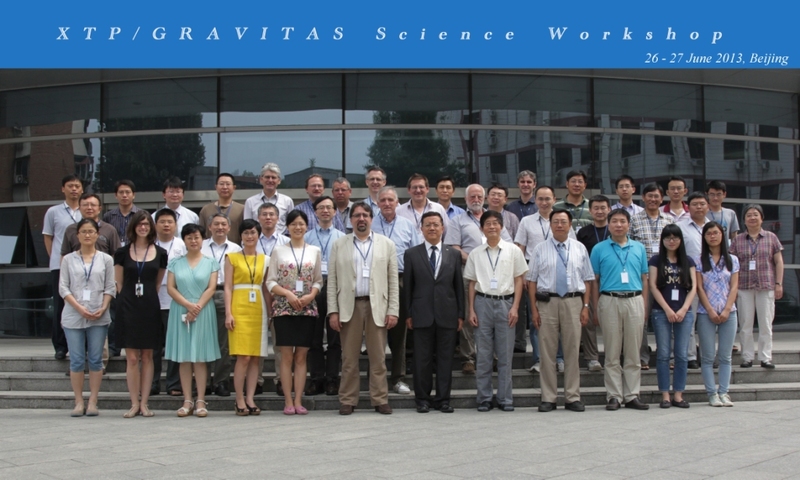 The XTP/GRAVITAS Science Meeting is the first of a series of science meetings organized at ISSI-BJ. The meeting was convened by Professor ZHANG Shuangnan from the Institute of High Energy Physics, Chinese Academy of Sciences (IHEP, CAS) in Beijing, and Professor Kirpal Nandra from the Max Planck Institute for Extraterrestrial Physics (MPE) in Munich. More than 50 scientists and researchers from worldwide institutes and universities such as MPE, Research Institute in Astrophysics and Planetology (France) and Commissariat a l'Energie Atomique (France), Istituto Nazionale di Astrofisica (Italy), Leicester University (UK), Purdue University (USA), University of Geneva (Switzerland), IHEP, (CAS), NSSC (CAS), National Astronomical Observatories (CAS), Purple Mountain Observatory (CAS), Shanghai Astronomical Observatory (CAS), China Academy of Space Technology, Shanghai Academy of Spaceflight Technology, Peking University, Tsinghua University, Tongji University and Nanjing University attended the meeting. During the two-day meeting, presentations and discussions were given on XTP/GRAVITAS scientific objectives, payload key technologies, possible scenarios of XTP/GRAVITAS merge and other international cooperation possibilities. The interaction between the scientists contributed to define more precisely the science objectives and the design of this future collaborative project. This meeting is a further step towards international cooperation between China and Europe.